Twin Lakes Playhouse creates artistic vitality throughout the Twin Lakes area through diversity and illustration to support an individual´s interest in the performing arts. Are you interested in either acting or directing? Download these forms and return them to the address listed at the end of the page. We are having an Improvisational Workshop for Teens and Adults on August 11th at 7:00 pm. It is open to the community. You can contact Deb Smith at 870-421-4026 with any questions. Age 8-18, May 5-6, 2018 Saturday 9:00-4:00, Sunday 1:00-4:00 You must pre-register. Age 13 and over, January 20-21, 2018 Saturday 10:00-4:00, Sunday 1:00-4:00 You must pre-register by January 20th. We provide cultural productions and programs that contribute to quality of life and economic development in the community and promote public awareness and individual growth for non-professionals through theatre arts and technical direction. The playhouse educates by offering training in all phases of the theatre arts and administration of the theatre, creating a foundation and individual and group challenges. Thus, when considering offering a more precise challenge to our community´s youth, in 2006 Twin Lakes Playhouse developed the Education/Outreach Program. This program exists mainly to bring theatre and theatrical education to children and young adults through a school, library, or youth center environment and now, on the stage at Twin Lakes Playhouse. Our first project was a short audience-participatory skit geared toward kindergarten-aged children and performed in their school music room. Three actors from the playhouse performed this skit with the help of several children chosen from the audience 10 minutes before each of the 4 performances. The director aided by dressing the children in “pirate gear” and painting their faces while discussing pirate character and language. The skit revolved around a pirate adventure of lost treasure, sailing to lands and finding clues left on a treasure map. A slide show was used to help the children more clearly understand the country and people they were visiting at each destination. In 2007, our first project was a skit performed at one of Mountain Home´s grade schools. This skit was included with the school´s celebration of “Arkansas Days”. Since the state insect is the honey bee, the skit was based on a few bees trying to get some honey but only finding obstacles in the process. The skit was followed by a brief history of the honey bee and its relationship to man and nature taught by Dr. Eddie Dry, the biology professor at Arkansas State University Mountain Home. Our second project was a four hour theatrical workshop at Baxter County Library in Mountain Home for ages 12-18 in July. A synopsis of the curriculum is mime, improvisation, and character study taught through a series of exercises, and then having the actors perform a brief scene using the principals that were introduced at the workshop. This workshop was again done in 2008 at the library. 2009 brought the Youth Acting Workshop to the TLP stage. The curriculum was extended to offer more exercises and games and an improved section in character study. The workshop ran for two days, four hours each day. There were nine participants in the workshop and six team leaders, all putting their personal stamp on the workshop. Following the workshop, we went into rehearsal for our first play produced through this program, BIG BAD, by Alec Strum. Four of the workshop participants auditioned for the play and four were cast. We also added five more newcomers to our membership. 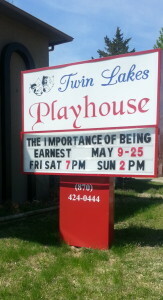 The play was presented over one weekend and was highly successful. Please check back with us periodically to learn more. We welcome new participants to the Education/Outreach Program and encourage those interested to contact Deb Smith at the Playhouse, 870-424-0444.